Cook beef and onion in 4-quart Dutch oven over medium heat, stirring occasionally, until beef is brown; drain. Stir in Sauce Mix, water, basil, pepper and garlic. Heat to boiling, stirring frequently; reduce heat. Cover and simmer 10 minutes, stirring occasionally. Stir in Pasta and mushrooms. Heat to boiling; reduce heat. Cover and simmer 10 minutes. Sprinkle with parsley. 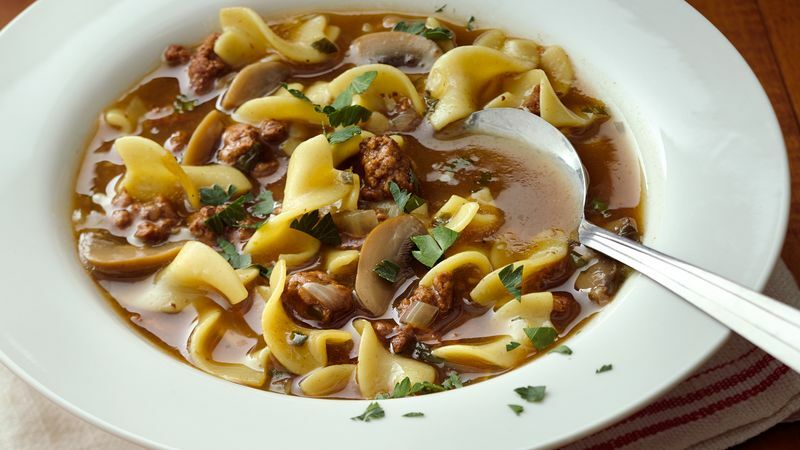 For a heartier, robust flavor, add a splash of dry red wine to the soup when adding the Pasta and mushrooms. Serve this soup with a crisp cucumber and red onion salad. Marinate the vegetables in seasoned rice vinegar in the refrigerator until ready to serve.